In the spirit of total disclosure I admit to perhaps a scream or two when I opened the email from Chrissy asking me to be a guest designer this week at CAS(E) this Sketch! I am delighted to join in with such a talented group of gals this week! This card is truly all about the stamping! 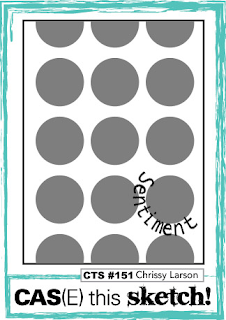 I stamped 15 circles in Soft Sky then stamped 14 cups with Pear Pizzazz. Real Red was perfect for that wake up cup! It seems fitting that Early Espresso ink finished it up! So grab your morning cup of whatever gets you going and enjoy the wonderful cards this team has for you! Once you are inspired I hope you will join in at CAS(E) this Sketch! It is a fun sketch....enjoy! Congratulations on guest designing for CAS(E) This Sketch! Your card is fabulous and so fun! Great take on the sketch! Woo hoo!! Congratulations on being named a guest designer, a well deserved honor!! :) Fantastic card, can't wait to go play along with the sketch! I am as in LOve with this card as a girl could be, Linda!!! Thanks so much for playing cards with us girls at CTS this week! LOve having you and your fabulous eye for design! I love your take on the sketch -- this one would have scared me to death! And I love your color palette. Very cute card, Linda! Great job with the sketch, Linda! Love these colors and the cups on the circles are genius! Yay! You absolutely ROCKED the sketch...LOVE your fabulous card!!! This is adorable Linda! 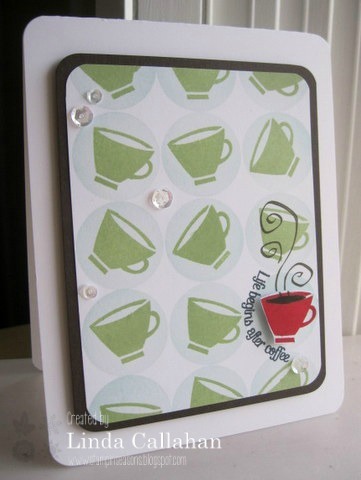 I'm always on the lookout for great coffee cards, and this is one I plan to CASE! Thanks for the inspiration--always fun to see how others put their own stamp on life. Such great details and a fabulous design, Linda! I love your colors and the layered stamping. So happy to see you as guest designer. Way to go! This is such a great design! I'm sure that if I attempted something like this I'd still be obsessing about the placement of the circles and the coffee cups but you've made it look like this was a breeze! And I still say that red cup is awesome! Great to have you as our guest this week Linda! I love these cups in the circles…what a great design! That red cup just says it all! Adorable! Thank you SO much for joining us as a guest designer this week, Linda! Your card is amazing!